Sunday 3rd June was, of course, one of the days of the Queen’s Diamond Jubilee weekend. We’d already sent the Queen a greetings card signed by people who’d attended our services on the two previous Sundays. (We’ll let you know if we hear anything back.) We hope 3rd June was a special day for the Queen. It was definitely special for us. It had two themes – reigning, and raining! In the morning we joined with St Frideswide’s, the Church of England fellowship that shares the building with us, in a joint service of worship. It was great to see our Church so full, and great to have the problem of finding seats for everyone. We celebrated God’s reign together, and learnt something of the original meaning of ‘jubilee’. (If you don’t know what ‘jubilee’ was orginally all about, try looking it up. You’ll be astonished at what you find.) And we celebrated the Queen’s reign too. We sang both verses of the national anthem (yes, there are two), and we prayed a special prayer for her that had been written for the service in St Paul’s cathedral on the Bank Holiday Tuesday. 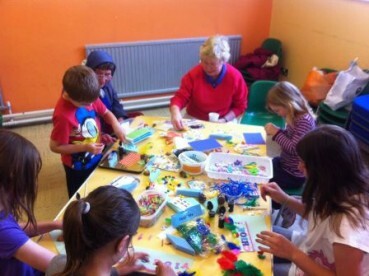 Then in the afternoon we held a Family Fun Day (see photos below). We’d expected to hold it in the gardens behind the Church Centre. But it rained all day so we had to move indoors. This was OK for most of what we’d prepared – the bouncy castle, face-painting, flag-making, and the table top activities such as roll-a-penny. It was OK too for our BBQ, which was cooked outside – but eaten indoors! Unfortunately, some of the sport activities we’d prepared had to be shelved, such as sack races, 3-legged races, and egg-and-spoon races. Despite the rain, hundreds of people came along, mostly families with children. Everything was free – the BBQ food, the bouncy castle, and so on. This (let’s be frank) probably meant we got extra visitors. Even so, it was terrific seeing so many people enjoying themselves in our Church Centre. We hope that a whole lot of people who’d maybe never been in our building before now appreciate that it’s a Church. Maybe we surprised some of them by showing that Christians like having fun.